(e.g. V-Ray Next, V-Ray, Corona, finalRender, mental ray, Scanline). Read what's new in the psd-manager 4.0 announcement. 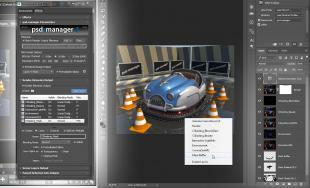 Saving the rendered image as a layer in a PSD file is an easy task; psd-manger can do this and much more. It lets you add all render elements of your scene as layers to a PSD file. 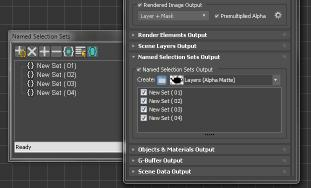 Presets and automatic layer sorting make it a breeze to setup the correct layer order. 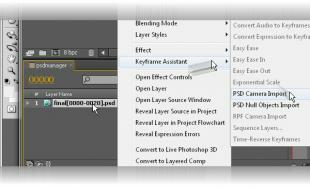 You may also manually control the blending modes along with the order of the layers. But psd-manager doesn't stop there. What you really need during post production and for last minute changes are accurate antialiased selections/masks. That's why psd-manager allows you to add selections or layers for each object/material of your choice to the final PSD. Gone are the days when you had to draw selections by hand or to render time consuming additional passes to get them. psd-manager relies on 3ds Max core capabilities, like the G-Buffer and render elements, which make it fast, extendable and in addition, open to all renderers. How can I use such a feature rich PSD? psd-manager 4 gives you the combined power of render elements, anti-aliased object and material selections in every application that supports PSD files. The possibility to alter every aspect of your image for one or multiple objects and materials in post, will change the way you work. Nothing else will save you so much time for less then 5€/5$ a month. Hundreds of antialiased masks can be produced using little memory in record time. Simply impossible using render elements. You will have all the masks available you will ever need. Create masks from objects, material, 3ds max layers, named selection sets. Requires V-Ray or Scanline Renderer. Powered by deep data. 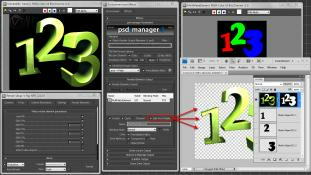 psd-manager allows you to output each render element in your scene as a single PSD layer (or channel). For each render element you can decide if it will be exported and how. V-Ray specific additions include full V-Ray Framebuffer Support, Mask generaton from Deep Data, Save VFB Color Corrections as Adjustment Layer, MultiMattes can be split into multiple layers & are named, Denoiser workflow enhancements, Presets for all render elements, Enable color corrections per element, Save extra channels such as Bloom & Glare. New in psd-manager 4 is the support for Corona Render Elements Output. Builtin presets for all Corona render elements save time. Edit output options while your render is still ongoing. 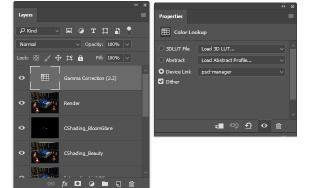 Mask elements are split into multiple layers to be easy to load as selections in Photoshop and renamed automatically. 3ds max Named Selection sets can now be used for quick and easy creation of masks. User friendly, since no IDs need to be assigned. Masks can be exported as layers (Alpha Matte, Luminance Matte, Render Cut-out) or channels. Work non-destructive and embed Gamma correction and V-Ray color corrections as adjustment layers. Only psd-manager can reproduce 3ds max Gamma correction exactly in dark tones using special constructed color profiles. Matching your framebuffer and allows working linear even in 8/16 bit PSDs. 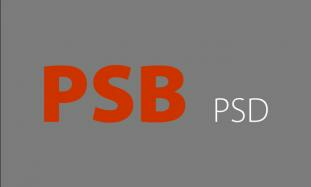 For the most demanding projects psd-manager 4 now supports the PSB format. Allowing images beyond 30.000 pixels and several Gigabytes in size. Automatic switching to PSB ensures your image data will be saved even when you exceed the limits of the 'smaller' brother PSD. 3ds max layers can be used for quick and easy creation of masks. User friendly, since no IDs need to be assigned. Masks can be exported as layers (Alpha Matte, Luminance Matte, Render Cut-out) or channels. Export high dynamic range images. Why start with another floating file format like OpenEXR if you will create a Photoshop document anyway? After Effects reads 32-bit PSD files fast and can even open them as a composition. psd-manager scene data output lets you embed camera position, orientation, FOV and point helper locations. Use the included free After Effects plugin to create perfect matching animated cameras and null objects in your composition. Both network rendering and distributed rendering require no psd-manager license. So you can render PSD/PSB files as fast as possible.